With the Smaller new design and fixed cable makes it Great for on the go Laptop users, easy to take with you for your Presentations or for your Hotel stay to watch your shows on the Big Screen. Tired of watching your TV Shows on your small Laptop Screen? Introducing our new product that allows you to watch your shows on your HDTV! Just plug in the ViewX-HD to your USB 2.0 port on your Laptop or Desktop Computer, connect your HDMI cable from our device to your TV and Voila you will be enjoying your shows in full Screen HD. 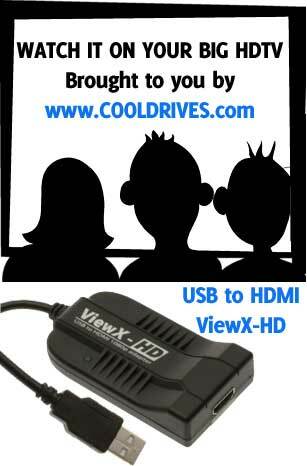 Application: ViewX-HD - USB to HDMI adapter allows you connect an extra HDTV/monitor to your desktop or notebook computer via USB port (include Video and Audio). Support max resolution up to1920x1080 regardless your computer display card resolution. The connected TV/monitor can be configured to either primary screen, mirror or extend the Windows desktop which include the visibility of more applications at the same time. ViewX-HD is the best choice for your HD-display application. Easily connect additional HDMI TV/monitor via USB 2.0 port. Plug & Play; Easy installation and operation. Support rotation (Normal/Left/Right/Upside-Down) function control. Support KVM switch and USB hub connection. HDMI 1.2 compliant. - Video : Supports pixel rates up to 165MHz, resolution up to 1080p. - Audio : Supports 2 channels (Stereo) audio. Connectors: - USB type A male (build in USB cable) - HDMI type A. Quick Installation Guide x 1.